Now, the shoes featured in the recent closet post: my one and only Onitsuka Tigers. Sis was really into the Onitsuka Tigers a few years back before I came to Perth. She has about three pairs and I bought my first pair along with her first. She dragged Mum and Dad to Red Star in Paragon and finally got hers. Me being the annoying elder sister I am, I had to have one too. So I told Daddy that he said he would get me something for fetching him water that afternoon. And he could get me that. HA HA HA. Funny he actually said yes. So I chose this brown pair. Because of the lace overlay design and I thought it was easy to match and unique too. Because this pair has history to it, I thought I would post about it here. After all, some shoes are bought not only for aesthetic beauty, but also for its history and uniqueness and of limited editions. Its iconic sneaker is Mexico 66 with the trademark stripes now known to ASIC. 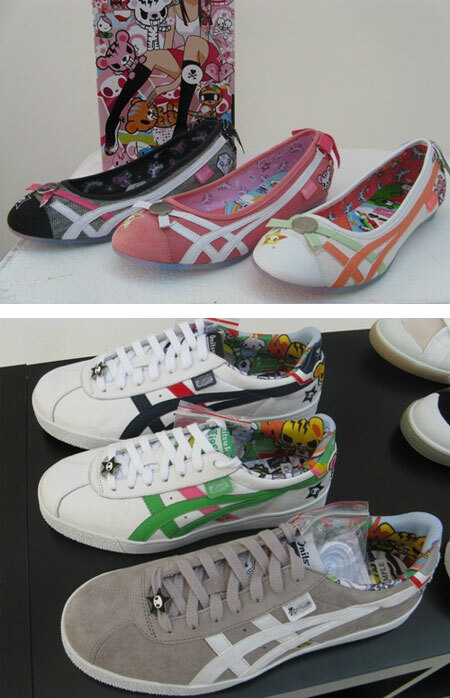 Onitsuka comes in limited pieces in each design and each size. They are like collector's items. 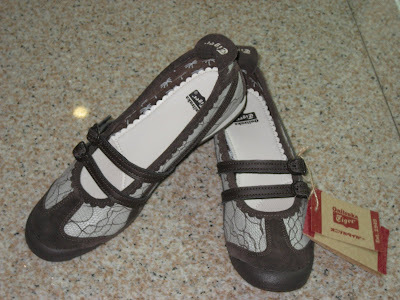 I got this flats design, as it is more feminine and I don't really wear normal sneakers as much. The brand also frequently team up with various designers to come out with different collections. I am sure many remember the Toki Doki collection! Super adorable. Sis has the one far right in the top photo below. And Li Jia has the same one plus another sneaker one, middle of the second photo. So yeah, pretty popular eh. I know boys who love the tigers range and to me, they always look very stylish in an atheletic sort of way. When I see a cute guy, his shoes are just as important to me. If I see a good looking pair of shoes before I notice the face, it helps too. HA HA HA. First impressions do count alright?! HA HA HA. Apart from them looking good, they offer the comfort soles only sports shoes do. I love my Onitsuka so much I hardly wear them. Oh alright, I really must bring her out for a spin soon. Perhaps in the next few days when the rain stops and the sun comes out to play.